Top Line: Hilco is a one-stop shop for the in-office lab, offering everything from dyes and adjustment colors to Rx trays. The company also has strong market positions in professional and consumer eyewear accessories; protective eyewear—Rx sun, Rx sports and Rx industrial safety; and eyecare products. Top Line: For 40 years, Santinelli International has advocated that ECPs need a top-performing In-Office Finishing lab in order to succeed long-term. Their ongoing commitment to quality, innovative technology, technical expertise and unmatched customer service, have earned them a leadership position to be proud of. Top Line: FastGrind is an all-in-one modified lens surfacing system. Designed for the independent optical customers, the system takes up less than 5 square feet of space while maintaining affordability. FastGrind offers efficiency, cost savings and enhanced customer service. Top Line: Hilco’s extensive product range—more than 20,000 products—includes a large selection of bench tools. The product range includes pliers, screwdrivers, wrenches, drills/taps, tweezers and files. The company also offers fashion eyewear, low vision products and lens cleaning products. Hilco’s focus on innovation, service and value have strengthened its market position. Top Line: Carl Zeiss Meditec is one of the world’s leading medical technology companies. The company supplies innovative technologies and application-oriented solutions designed to help doctors improve the quality of life of their patients. It provides complete packages of solutions for the diagnosis and treatment of eye diseases, and creates innovative visualization solutions in the field of microsurgery. Carl Zeiss Meditec's medical technology portfolio is rounded off by promising, future-oriented technologies such as intraoperative radiotherapy. Top Line: Carl Zeiss Meditec offers a comprehensive portfolio of products and services that enable eyecare professionals to meet the demands of an increasingly challenging health care environment. The company develops leading-edge technology to assist in the diagnosis, treatment, follow-up and management of the most common eye diseases, and provides comprehensive connectivity solutions to help increase efficiency and productivity with electronic workflow. The company offers clinical applications training and a broad range of service and support options—all with the goal of helping its customers overcome their day-to-day challenges so they can focus on delivering the best possible patient care. 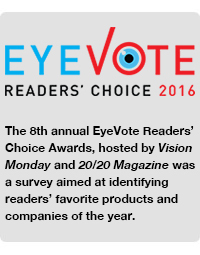 Top Line: For seven years in a row, Eyefinity was voted EyeVote’s favorite practice management software—thanks to their customers. The feedback and insights provided by customers are what have enabled the company to deliver leading practice management/EHR software. Eyefinity solutions specialize in helping practices increase revenue and enhance patient care. With cloud (Eyefinity Practice Management and AcuityLogic) and server-based (OfficeMate) solutions, Eyefinity has a practice management solution for all practices. Top Line: Used in more than one-third of computerized eyecare practices to automate everyday tasks, OfficeMate, an Eyefinity on-premise practice management solution, is a leading solution in the optical industry. OfficeMate satisfies all practice management needs by maintaining and managing patient demographic information that is easily entered and accessed. Top Line: RevolutionEHR is a leading provider of cloud-based practice management and electronic health record systems for the eyecare community. RevolutionEHR provides service to eyecare providers in all 50 states and Canada. Top Line: ExamWRITER, an Eyefinity on premise EHR program, is a leading solution in the optical industry. ExamWRITER improves efficiencies and simplifies workflow by automatically documenting and updating a new exam record with the patient's past medical history and presenting prescription. The built-in ICD-10 auto-coding generates codes based on the doctors’ exam notes. And, drawing tools enable users to include graphical images with relevant notes and highlights into the patient record. Top Line: ACEP/ABS is a leader in software and application development for the optical industry. ACEP believes in anticipating opticians’ needs for sales-support solutions and offering them access to innovations and new-generation tools that are essential to their fast-changing profession. Established in 1994, Smart Mirror solutions have helped over 35,000 optical stores to dispense and measure eyewear more easily. Top Line: Smart Mirror helps Rx patients see themselves for the first time in their eyewear selection and lets them compare several frames at once. It enables opticians to demonstrate premium lens options and allow patients to visualize how they will see through their finished lenses. The systems provides all fitting measurements for advanced digital designs, ensuring a proper fit and reducing remakes. Top Line: Smart Mirror Mobile App is a powerful tool designed to help opticians dispense and measure eyewear. It delivers an enhanced purchasing experience to each patient and, ultimately, builds store profitability.